​Before Colgate was tasked with facing the high-powered Tennessee Volunteers, they were forced to combat fake news at its worst. 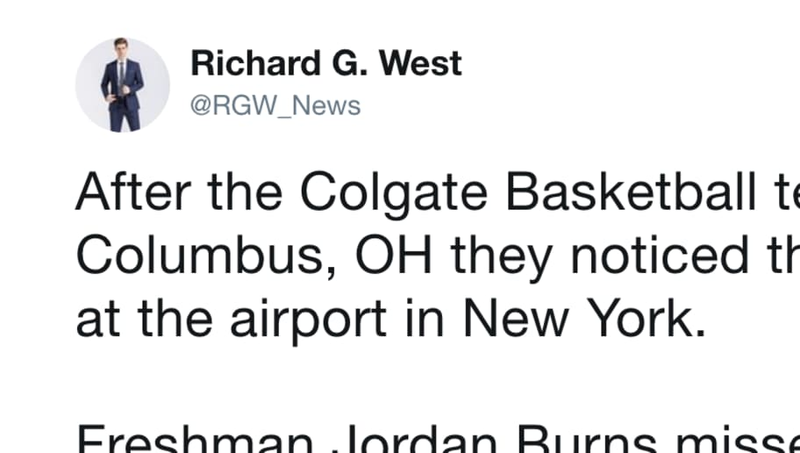 ​A rumor circulated on twitter that Colgate's Jordan Burns missed the team charter flight to Columbus via a fake news reporter. You can't make this stuff up. This account has less than 700 followers, yet was retweeted over 2,000 times, even fooling the likes of CBS News. This is certainly not a good look for sports journalism as a whole, and speaks to the need for basic fact checking. For one, Burns isn't even a freshman. Burns' mother apparently called him after learning of the report, only to surprise her son when she brought up the rumor. Burns had been with his team the entire time, and was preparing for the team's upcoming ​Tournament game against Tennessee. We've seen major media outlets fall for fake Woj, Rapoport and Schefter accounts in the past, but the fact this random man with no name recognition was able to fool this many people is concerning.